TOKYO - January 18, 2019 - LINE Corporation announces that LINE@, a corporate service aimed at retailers and small and medium-sized enterprises (SMEs), has topped three million accounts. The service allows retailers and companies to create LINE accounts and tap into the LINE app's 78 million (MAU) strong Japanese user base*1 and high engagement rates. Along with the ability to send information directly to users, companies can leverage these accounts for their business activities. 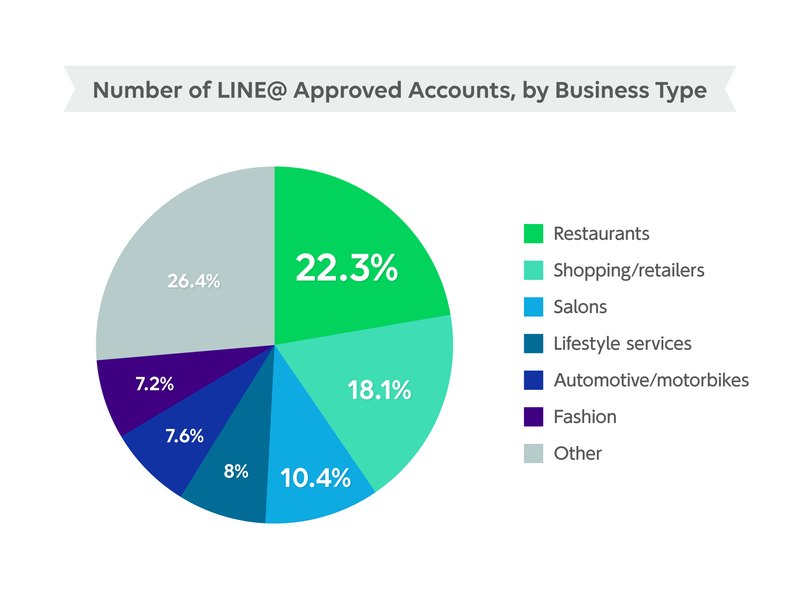 Launched in December 2012, LINE@ is already used by a diverse range of businesses – including restaurants, apparel stores, salons, and hotels – to communicate with users and promote products and services. 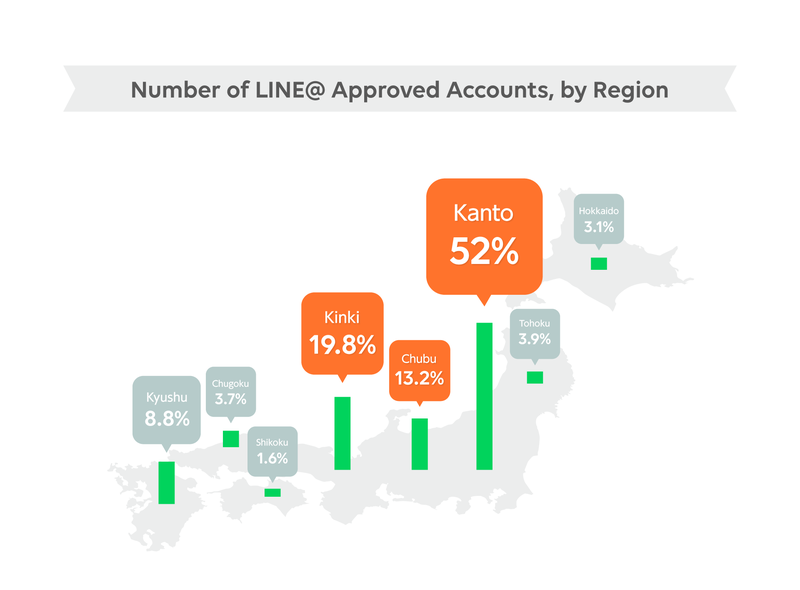 In 2018, the sixth year since LINE@ was launched, over 370,000 approved accounts*2 were created, propelling the total number*3 of LINE@ accounts (including standard accounts) to over three million. Below is a closer look at what types of businesses are using approved accounts, and how many have been created in different regions of Japan. *2 Approved account: Accounts which pass the designated review process are granted an "Approved" badge and will appear in search results within the LINE app. Approved accounts will also have access to expanded features and payment methods. *3 Standard account: Accounts which can be created by anyone (individual or business). Since December 2018, LINE Services for Business Partners has been undergoing a full-scale redesign to improve linkage of user data between different solutions. Accomplishing this will enable businesses to deliver tailored contents and services and as a result, cultivate long-term relationships with users. Similarly, LINE@’s upcoming merge with LINE Official Account (aimed at large enterprises) from spring 2019 will see even more features become available. With the merging of the two services, features which were previously limited to paid plans (e.g. rich messages and targeted messaging) will become available to users of all plans. Additionally, LINE@'s 1-on-1 chat and other features such as multi-person chat will also be updated to make it easier for companies and retailers to use LINE's services according to their needs. After the service merge, users of LINE@ approved accounts and other LINE corporate accounts can continue using the LINE Pay friending feature introduced this past November in 2018. * When users use LINE Pay to make a purchase in-store or online, the feature displays a prompt on the user's LINE Pay screen and asks if they wish to friend the store's LINE account. Retailers can then regularly send messages and coupons to these users, making consistent communication possible right from promotion through to purchase. With the merging of business account services and strengthened collaboration with LINE Pay, LINE will further expand the solutions offered to SMEs and small retailers. Through its platform and diverse range of services, LINE will continue to provide valuable information touchpoints for both businesses and users, and explore new and diverse ways to serve as communication infrastructure.